Peter Farrell of Loman Street said they would be back on the 4th of May (plus or minus 12 hours) and sure enough I saw my first returning Swift over Trim Castle bang on that date. Peter grew up on Loman Street and has a sixth sense for Swifts and can even tell to which house a certain bird flying around belongs. 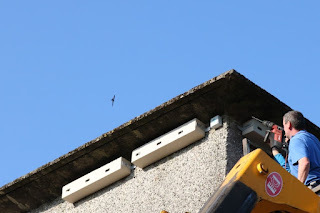 Numbers of Swifts gradually increased during May and Peter, Asier Pagazaurtundua and myself put up three Genesis nest boxes on the highest point on the Town Hall. This was just in time for the non-breeding birds to inspect them on their arrival back from Africa. Peter in action, some eight metres up, creating our "Swift tower"
The boxes will support the Swift colony already established for decades on Castle Street. Trim Tidy towns got a grant from Meath County Council to buy the boxes and thanks to the Council also for permission to put the boxes up on the town hall. Thanks to Brian and Kim in Trim Tidy Towns for co-ordinating the funding and Andrew O’Brien for the hydraulic platform to access this site. Peter Farrell did some handy work also on Loman Street, putting up four single chamber Swift boxes under the overhanging rooves of two houses at the end of the terrace. The soffits which meet the roof of these houses do not give Swifts access. One of the houses in the middle of the terrace, where Swifts nest both at the back and the front of the house, had renovations to the roof carried out in October 2017. 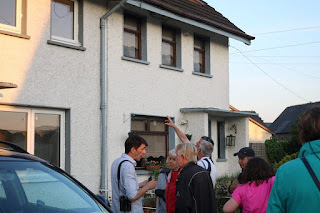 This was outside the nesting season and Peter was on hand to advise the builder of the importance of this house as a nest site and also with the support of Patricia Farnon who lives there and our local National Parks and Wildlife Service Ranger they ensured that the soffits left a space for the Swifts to continue to have access to their nest site. With advice from BirdWatch Ireland the builder simply cut several 30mm wide strips out of the soffit creating a space between the soffit and the wall. We saw in May that the birds were able to enter this space and continue to nest in what is one of the main nest sites in the town. So when Brian Caffrey of Birdwatch Ireland arrived for a repeat of the 2017 Swift walk in Trim we had a lot of new developments to show him. We started our 2018 walk again from the bank of the Boyne where Sand Martins were feeding on the insects also flying over the river and as we crossed the bridge into the town flew these birds were flying over our heads. Brian pointed out that the Swifts were bigger than the Sand Martin, and spend virtually all of their life airborne, never seen resting on wires as Swallows and Martins frequently do. They also don’t build a nest unlike the mud dwellings of Swallows and Martins and the nest, in a secluded place usually under a roof and on the top of a wall, is made of a few feathers caught on the wing. Brian pointed out the distinctive scythe shaped wings held straight out from the body and in a level flight is the fastest flying bird. Then to Castle Street which was again busy with screaming parties of Swifts, and we explained that some of the Swift screams were actually from a recording played from a speaker high on the town hall, a lure to help Swifts find the nest boxes and reassure these colony nesting birds that it is a secure site. We will keep an eye on this site over the summer to see if we have any success, but it could take a couple of years before young birds from the local population are prospecting for a nest site. Its definitely a buyers’ market for Swifts in Trim with the nestbox options now provided for them. This year the weather was exceptionally good, so we added a walk around the Castle and along the marshy area which was once a moat. Kiltale Brownies recorded 18 different species of birds, in the town, in the hedges in Trim’s porchfields as well as along the Boyne. We are still on the lookout for the peregrine falcon that has been sighted on Trim’s yellow steeple, but that’s for another day. 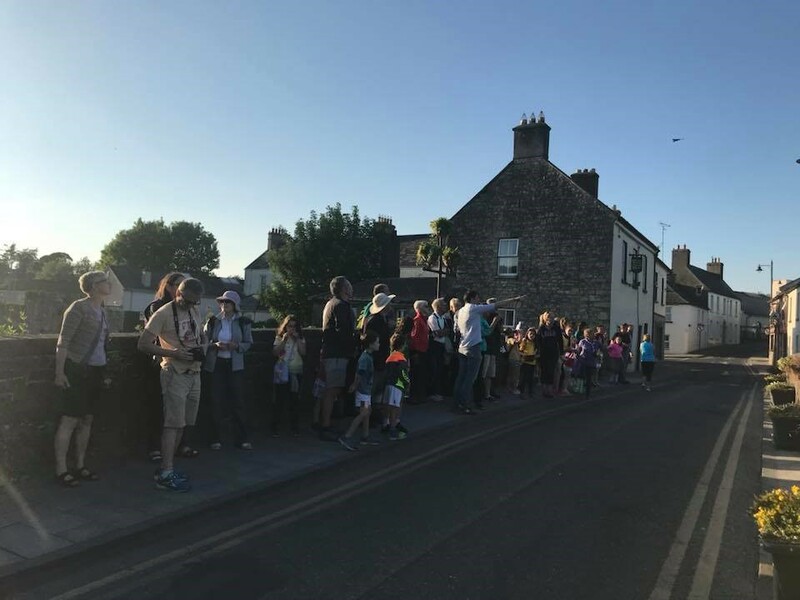 We finished the walk in Loman Street, enjoying the customary spectacular display of low flying Swifts going in and out of their nest sites. At least a dozen birds whizzed up and down the street passing just over our heads. This was a great end to a great event and a conservation project which has engaged local children, residents co-habiting with Swifts, Tidy towns, County council and members of Birdwatch Ireland and Birdwatch Ireland professional staff. 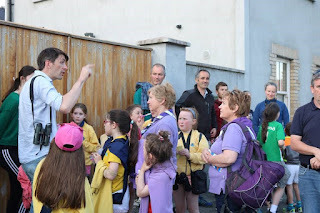 People had travelled from all over Meath for the walk, and we also had visitors from county Monaghan keen to develop similar community based initiatives there. The town of Trim has found another interesting part of its heritage and can be proud of the conservation work done; maybe the Swifts can become another tourist attraction. 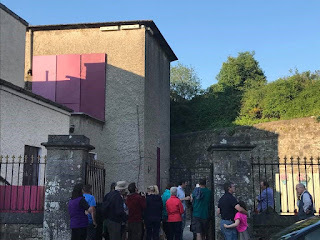 The Meath Branch of Birdwatch Ireland named the Swift its bird of 2018 and we would like to see the work in Trim replicated in other towns in Meath, contact The Meath Branch of Birdwatch Ireland if you want to get involved and help protect this species which amber-listed in Ireland due to a decline in the breeding population. The European population is currently evaluated as Secure. - 18,000 people who receive our e-zine, a monthly update about our work.